Offerings to the Japanese deities always contain at least one plate with food from the sea and one with food from the mountains, one fish and one radish. This photo shows an offering from the fish of the sea and fish of the land (sweetwater fish). The origin of this custom goes back to the two Shino brother deities of Sea and Mountain. Hoderi no mikoto (Kojiki), Hoakari no mikoto, Hosusori no mikoto, Ho no suseri no mikoto, Ho no susor no mikoto, Hosuseri no mikoto, Ho no susumi no mikoto (Nihongi). An offspring of Ninigi and Konohana Sakuyahime. Accounts differ in the description of the process of his birth and origin of his name, but most are in agreement that Umisachi ("sea-treasure") was the elder brother to Yamasachi ("mountain-treasure"; otherwise known as Hohodemi), and that Umisachi's mother set fire to her parturition hut, whereupon Umisachi was born as the flames reached their peak. Umisachi means to receive the bounty of the sea; he later became subject to his younger brother Hohodemi (Yamasachi) and became known as the ancestor of the clan Ata no Hayato. Kojiki states that Umisachi's proper name was Hoderi no mikoto, the first of the three children produced by Konohana Sakuyahime. Most of the variant accounts recorded by Nihongi, however, state that the kami Umisachi was Hosuseri-the second child born to Sakuyahime in the Kojiki account. Shinsen shōjiroku likewise describes the ancestor of the Hayato as Honosusari no mikoto. Further, Nihongi quotes an "alternate writing" that identifies Umisachi with Honoakari no mikoto. The kami's various names have been interpreted to mean "bright shining fire" or "ripening rice ears." The account describing how Umisachi became ancestor of the Hayato is similar in both Kojiki and Nihongi accounts. Upon the suggestion of the younger brother Yamasachi, the two kami agreed to exchange the tools of their livelihoods - Yamasachi's bow and Umisachi's fishhook - but neither was able to successfully capture game using the other's implement. Umisachi asked Yamasachi to return his fishhook, but Yamasachi lost the hook, leading to recriminations from his brother. Finally, Yamasachi obtained Watatsumi's help in recovering the lost fishhook, and returned it to his brother Umisachi, but Umisachi was cursed and fell into poverty. Enraged, Umisachi planned to fight Yamasachi, but he was prevented by the magic "tide flowing jewel" and "tide restraining jewel" that Yamasachi had received from Watatsumi, with the final result that he pledged to become Hohodemi's protector and vassal. As a result, his descendants were said to have guarded the palace precincts "like dogs" (i.e., in place of barking dogs), or that they became jesters who painted their faces and hands, and mimed Yamasachi's drowning scene.
. Taiguruma from Kagoshima　鹿児島の鯛車 sea bream toy . Offspring of Ninigi and Konohana Sakuyahime. 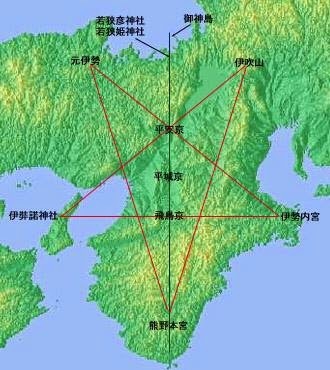 Called Yamasachihiko ("mountain-gift-man") for his unique success in the hunt, he is known as a member of the second of three generations of kami related to the Hyūga area. Kojiki describes Hohodemi as the last-born of three brothers, while some of the variant accounts in Nihongi relate differing birth orders. In any event, Hohodemi was born as the flames were abating after Sakuyahime had set fire to her parturition hut. As younger brother to Umisachi, Hohodemi (Yamasachi) suggested to his brother that they exchange the magic tools of their respective occupations (Umisachi's tool was a fishhook, while Yamasachi's was bow and arrow). After the exchange, however, Yamasachi lost Umisachi's fishhook, and while he broke up his own sword in order to fashion many new fishhooks and repay his brother, he was rebuffed by Umisachi. Wandering despondently along a beach, Yamasachi met Shiotsuchi no kami, who placed Yamasachi in a basket and sent him to the palace of the kami of the sea. 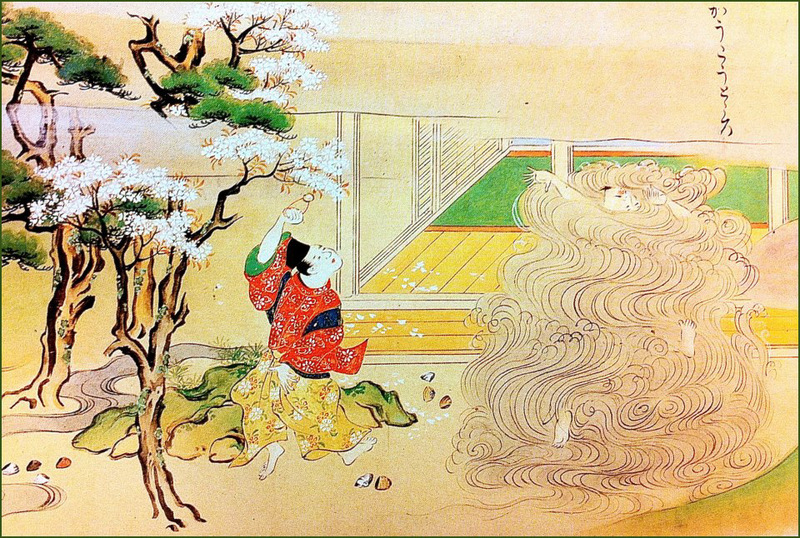 Arriving at a well outside the palace gates, Yamasachi climbed a katsura tree and was entertained by the sea kami Watatsumi, receiving the latter's daughter Toyotamabime in marriage. After three years, Yamasachi prepared to return to the land, at which time Watatsumi found the missing fishhook, which had been swallowed by a sea bream. Returning the fishhook to Yamasachi, Watatsumi also furnished him with magical formulae and rituals, and a "tide-raising jewel" and "tide-lowering jewel." With these gifts of control over the water, Yamasachi was able to bring his elder brother under his own subjection. Yamasachi and Toyotamabime had one child, but since Yamasachi spied upon Toyotamabime and saw her transformed into the form of a wani (lit., "crocodile," but probably referring to a shark) as she gave birth, Toyotamabime was shamed, and the passageway which had existed between sea and land was henceforth closed. The ho of the name Hohodemi describes both the "flame" at the time of his birth, and also means fully ripened heads of rice. In Nihongi, different characters are used to write the honorific title mikoto attached to Yamasachi and Umisachi. 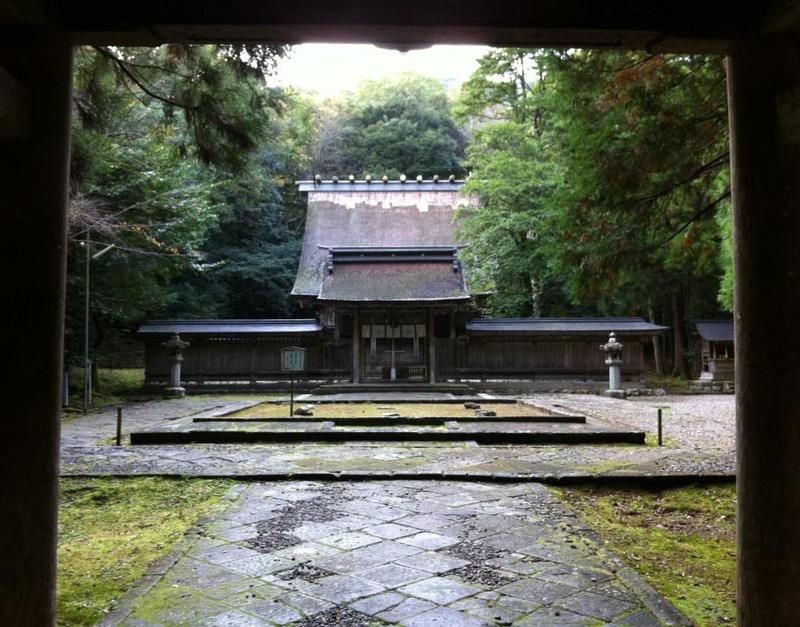 This difference expresses the relationship of lord and retainer, and reflects the fact that Yamasachi would go on to transmit the legitimate line of imperial succession to Ninigi, while Umisachi would be ancestor of the Hayato people who served the imperial court. According to the account in Kojiki, Hohodemi lived in the palace of Takachiho for 580 years and was later buried in a tumulus to the west of Mount Takachiho. Nihongi relates that he was buried in a tumulus at Mount Takaya in Hyūga (present-day Kyushu). source : Mori Mizue /　Kokugakuin University. who is the grandfather of Emperor Jinmu (神武天皇). 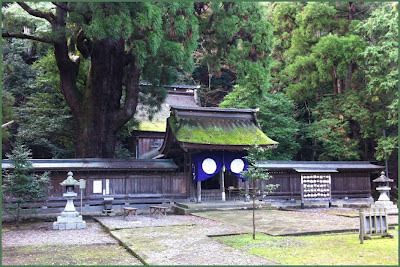 which is located close to Wakasahiko Jinjya (若狭彦神社). Enshrined deity is Toyotama-hime (豊玉姫), who is the grandmother of Emperor Jinmu (神武天皇). their grandson is the first Japanese emperor, Emperor Jinmu (神武天皇).
. Omizutori お水取り Drawing Sacred Well Water .
. Jinmu Tenno 神武天皇 First Emperor Jimmu .
. Cormorant, the messenger of .
. 鵜草葺不合尊 Ugayafukiaezu no mikoto . Hiko was formed from hi (sun) and ko (child), and has been used as a component of male names to denotes a blessed son. It seemed to connote youth and divinity in the ancient time, but the special implication gradually wore out, so that the word has come to only indicate the masculine of name bearers. Hiko often transforms into biko in compound words. YamaSachiHiko is thus written as YamaSachiBiko in some texts (Kojiki is among them indeed! ), though biko may be changed to hiko at citations in my argument to avoid possible distraction. In divine and noble families, many female members had a name including hime, which is made up of hi (sun) and me (woman). As with hiko, hime often turns into bime in compound words, though hime may be restored at citations of bime in my argument in this essay. Sachi has diverse implications, though its original means is "gear," "tool," or "equipment." YamaSachi, a compound word made of Yama (mountain) and Sachi, thus originally represented a "gear for hunting on mountains," namely, a bow and arrows. In a similar way, UmiSachi, a compound word made of Umi (sea) and Sachi, was a "gear for fishing at sea," or a rod and a hook. This meaning is now obsolete in the Japanese. Sachi also denoted edibles gained with a gear. Specifically. YamaSachi was "hunted beasts," and UmiSachi was "quotedwords." 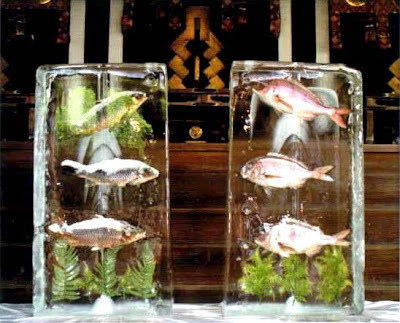 The denotation is almost out of use today, but survived just in the form of "Yama no Sachi" and "Umi no Sachi," which now represent not only beasts and fish but also encompasses other foodstuffs collected from mountains and the sea. Accordingly, Sachi connoted as well "the (much) gaining of edibles with a gear" in the ancient Japanese. Sachi also imported a mystical power closely combined with a gear that makes it possible for man to hunt or catch a lot of beasts or fish. The power became to be deemed as "luck" or "happiness," which is the current meaning of sachi, though its use is usually limited to literary expression and formal feasts. YamaSachiHiko thus means "a young man blessed in using the mountain gear (the bow and arrows)." UmiSachiHiko means "a young man blessed in using the sea gear (the rod and hook)." A similar legend about a young man from the sea who lost the hook of his elder (father/brother) and lived with a princess who later turned into a crocodile (wani) and about 8 islands created by the gods is found in the island of Malaita in the Solomon Islands. There might be a common origin of some mongoloid tribes that moved from a lost paradise called Sundaland (near the Malay peninsula) to the south and north ... and met at some time again in Japan. Even now in many parts of Japan the shark meat is called "wani". Refers to a high position where man is close to the deity, for exampel the head of a shrine. Through serving food offerings for the gods he partakes of their power. This may be the beginning of sharing one bowl for drinking tea (koicha). water, salt, sake, grains, vegetables, fruit, tai fish or katsuobushi. 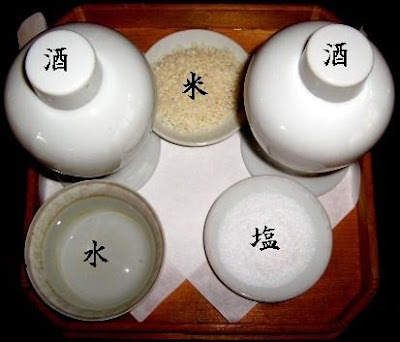 “honorable food” mige 御食(みけ), minie 御贄（みにえ）. cooked and prepared food 熟饌（じゅくせん jukusen）, raw food 生饌（せいせん）seisen. Ritual fire for the cooking has to be made with a flint stone （忌火・いみび）imibi / inbi.
. okorago 御子良子 shrine maiden at Ise shrine . They live in special quarters, kora no tachi 子良の舘. 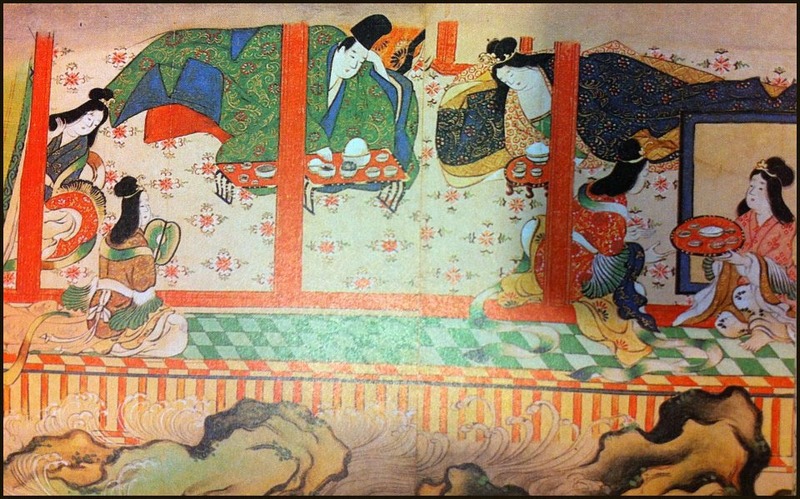 "rice on the memorial day"
During the Heian period, on two days of the year　（on the 11th day of the sixth and 12th month) on the day of the moon festival (tsukinami no matsuri 月次祭) , the deity Amaterasu Omikami would take part of the meal together with the emperor (shingojiki　神今食) in a special hall of the imperial grounds in Nara. jingonjiki 神今食 (じんごんじき)"deity eats with the emperor"
During the fasting period of this rtual, from the 11th day to the 13th day, hot water was also offered, and lamplight. On the 13th day of the sixth month of the lunar calendar, the emperor is relieved from his vow not to eat fish or meat (kessai) and the inbi no gohan ceremonies come to an end. The first thing he eats is this rice gruel. The gruel is served in an earthen potm, with some wakame soup. He eats three mouthful and then sticks his chopsticks into the rest. This rice gruel was not soft as it is now, but hard to be eaten with chopsticks. This is a deity revered by fishermen. At the town of Amakusa at the island Yokourajima 横浦島in Kumamoto each fishing family has its own Ebisu statue, made of stone and some are colored in red and blue and black.The statues are about 15 cm small to about 1 meter large. They are placed in front of the home, with the back toward the mountain, to make sure Ebisu can see the ocean and protect the fishermen. Small ones are placed in the front of each fishing boat and before starting the day, fishermen pray to this Ebisu for protection and good luck.